Love your 'Jane Platt'...but I'm so torn...I also REALLY like that powdery blue foliage on Blue Shadow. 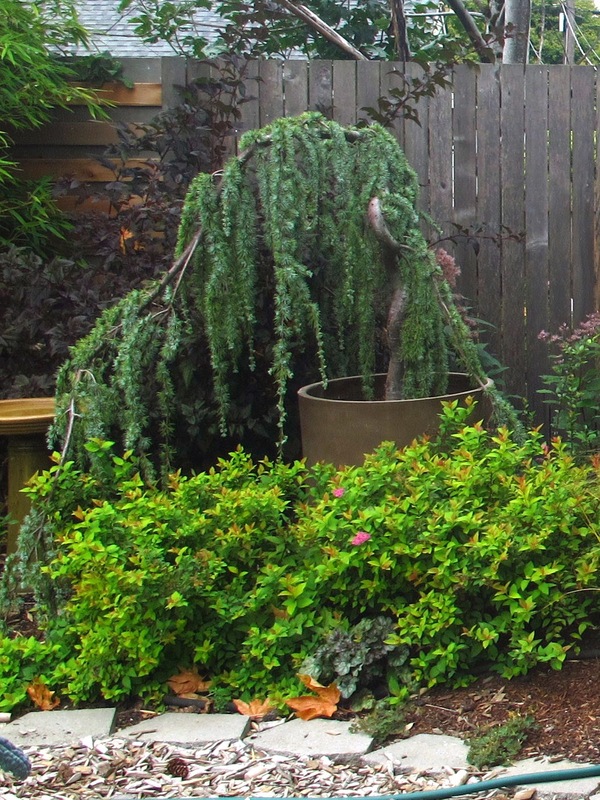 I love almost all Spirea (especially 'Ogon'), but sadly, landscaping crews have almost ruined them for most people. I saw a plant at a garden recently and thought of you...it was some sort of Ash (Sorbus) with some of the most intense fall color I've seen. Blue Shadow gets much bigger (5-6 x 5-6) where Jane Platt maxes out at 2-3 feet, if that helps future decision making. I definitely need something with true gold fall color. I can't believe you've been plant shopping without me! Oh, I love the Clown Whore. Poor thing, trying so hard. Love that Jane Platt too. It's a good thing so many plants turn such beautiful brilliant colors in the fall, because lots of other stuff just looks so terrible in its declining state. The colorful leaves make it easy to overlook the ugly. So true. Such a wonderful distraction they provide for their ugly neighbors! Beautiful, beautiful fothergillas. I have Mt. Airy and I have species gardenii. The species gardenii do vary their fall color each year, but never disappoint. One year they were solid butterscotch yellow all over, but usually they are kaleidoscope jewel tones like yours. Love your spireas too -- you picked some great plants for showy fall impact. Mt. Airy was the one I originally wanted but it gets just a touch too big for that spot. I think I'm going to be making room for a lot more! No such thing as a bad plant...just bad ways of using them. You obviously do not have that problem. I feel like I should just hand you my credit card. Every time I visit your blog I find a new plant that I must have! Now that I am getting rid of my second rose thanks to rose rosette disease, I have room for a fothergilla! I also secretly like the clown whore sedum. Some very nice autumn colour there! 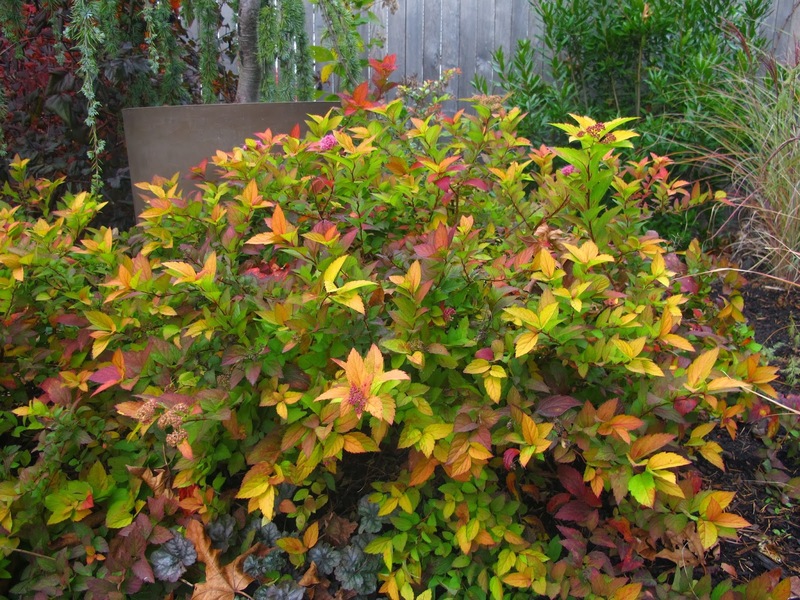 Funny you mentioned about the Spiraea, we nearly removed it as it was to be found everywhere here but it does well in its spot and has a nice colour so it was spared. Yes! 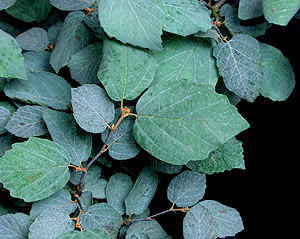 I've been wanting a Fothergilla. Nice to see a really hot one and that it's small is even better since I could surely shoehorn it into Longview Ranch somewhere...right? Love your colors! So why is that you don't like your clown whore sedum? It looks quite pretty to me. Then I have a present for you at the next plant exchange! There's just a little too much going on with that sedum for me. And I think everything is winding down and it's turning on the disco ball, so it feels really out of place to me. You definitely have room! Jane Platt stays nice and compact (supposedly). It was found in a Portland garden so I assume they aren't lying.